A recent discovery by palaeontologists working at a site in Patagonia has significantly increased our knowledge of prehistoric life. Very occasionally, when conditions are right, fossils can reveal the imprints of soft tissues as well as bone. 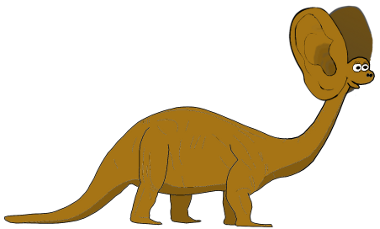 Such was the case with an almost intact specimen of a Brontosaurus found earlier this year, and its discoverers were considerably surprised to find that the animal had quite sizeable ears. "Yes sir, a good pair of ears is about the most useful thing that you could possibly have in the animal kingdom. Old Ralphy Rat knows it, when he's a-scurrying and a-scampering about after scraps. Old Mortimer Mole knows it when he's a-ferreting and a-fidgeting about for worms under the soil. So why not the dinosaurs? "And do you know what? The really super-great thing about ears is that they're useful for more than just listening to things. Oh boy! See, it used to get mighty hot back in the old days, what with all the volcanos and the acid rain an' all. So you're gonna need a decent hat and it's only your ears that are gonna to stop it slipping down over your eyes. "But the absolute greatest, most useful and toppermost awesome thing that ever did happen to those ears was that they evolved. See, over time, old Bronty and his chums, they got smaller and smaller and all covered over with feathers until they turned into the birds of today, like chickens and thrushes and parrots and things. And as they did, so those big ol' floppy ears turned into flappy wings. "And that's why the birds you see a-peckin' and a-bobbin' about your garden don't have no ears of their own, and why you'll never see a sparrow wearin' glasses."